We often use “mv” command to rename a single file in Linux. However, renaming multiple or group of files quickly makes it very difficult task in a terminal. Linux comes with a very powerful built-in tool called rename. The rename command is used to rename multiple or group of files, rename files to lowercase, rename files to uppercase and overwrite files using perl expressions. The “rename” command is a part of Perl script and it resides under “/usr/bin/” on many Linux distributions. You can run “which” command to find out the location of rename command. The rename command comes with few optional arguments along with mandatory perl expression that guides rename command to do actual work. -v: Print names of files successfully renamed. -n: Show what files would have been renamed. -f: Force overwrite existing files. For better understanding of this utility, we’ve discussed few practical examples of this command in the article. Suppose you’ve bunch of files with “.html” extension and you want to rename all “.html” files to “.php” at one go. For example, first do a “ls -l” to check the list of files with “.html” extension. Now, you want to change the extension of all these files from “.html” to “.php“. You can use the following “rename” command with perl expression as shown below. Note: In the above command we’ve used two arguments. First argument is a perl expression that substitute .html with .php. Second argument tells the rename command to substitute all the files with *.php. Let’s verify whether all files are renamed to “.php” extension, doing ls -l on the prompt. Now you can see above that all the html files are renamed to php. While doing critical or major renaming tasks, you can always check the changes by running rename command with “-n” argument. The “-n” parameter will tell you exactly what changes would take place, but the changes are not done for real. Here, is the example of the command below. Note: The above command output only displays changes, but in real the changes are not done, unless you run the command without “-n” switch. We saw that the rename command didn’t displayed any information of changes it does. So, if you want to get the details of rename command (like we did using “-n” option), here we use “-v” option to print the complete details of all the changes done by rename command successfully. To batch rename all files with lower case names to upper case. For example, I want to covert all these following files from lower to upper case. Just, use the following command with perl expression. Once you’ve executed the above command, you can check the changes by doing “ls -l“. You can see that the above command actually renamed all the lower case file names (with .HTML extension) to upper case. Similarly, you can also convert all upper case characters to lower case using the following command. To capitalize only first letter of each filename use the following command. If you would like to forcefully overwrite existing files, use the “-f” option as shown below. If you would like to know more about rename command, type the “man rename” in the terminal. 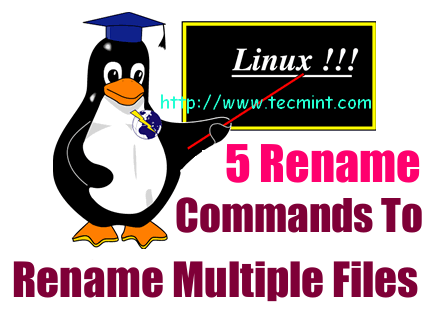 The rename command is very useful, if you are dealing with multiple or batch renaming of files from the command line. Do give a try and let me know, how far is useful in terms of renaming of files. Works differently on CentOS7. Couldn’t use any perl -like expressions. Only options are -v, -s, -h, -V.. This is great post, but in my case I tries nothing happening, can you please help me on this, I’m trying below. Something is wrong ? Its due to wrong commas, used in the command, try to use the correct commas as shown in the following command. if rename has some problems and different implementations (as suggested in some of the comments), then why is it any better than ‘sed’, which is decades older and very stable and well-documented? I got thousand of files with space in a folder. It is from Windows or something. I hate filename with spaces. What should I type in terminal to remove the space from the filename? Can you show me some example files that have spaces, so that I can help you out with proper command..
will clean up the folder beautifully. Be careful – the version of rename(1) on debian/ubuntu is based on Perl while the version on the red hat family isn’t – therefore the expressions aren’t portable. Amazing tips. This is why Linux is Awesome. Windows has an issue with the extention and files are copied with size 0, and recognizes them as .com executable. I discovered that it works fine when renaming the file to _com. I can even copy them over to a new mail server, and they are recognized by the new postfix server. Give a try again with the help of following command with little modification. You just saved 4 hours of my time and made me to do the same job of 4 hours in just 2 minutes. :) Amazing tips. This is why Linux is Awesome. Great! I works in Ubuntu 14.04 LTS. Can you please explain the perl expressions also? I don’t get the pattern where and why to use “s/ $/” or “y/” etc. It’ll be helpful if you explain it a little. this command is not working on redhat linux………… why ? May I know, is there any error you getting on the terminal while running the command? Please post here..
That is because OpenSuse, Red Hat and others do NOT use the same rename utility. I was a bit upset to see that Ravi said this is Linux, not Debian and it’s derivatives. I agree with you, rename is differently used in different flavors of Linux, specially on Debian and Redhat based systems..